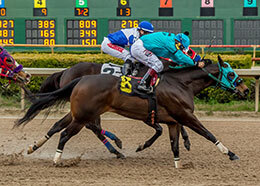 Freakin Patriot Dash (#6), under jockey Pedro Espinosa, gets up over Jw Who Dat (#2) to win the $25,000 Magnolia Stakes Saturday afternoon at Louisiana Downs. 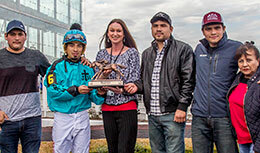 BOSSIER CITY, LA—JANUARY 29, 2019—It's no surprise to see conditioner Josue Huitron win stakes races in Louisiana, but today at Harrah's Louisiana Downs, he was both the owner and trainer of Freakin Patriot Dash in the $25,000 Magnolia Stakes. It was a determined effort by the son of Game Patriot out of the Streak and Dash mare Freakin Dash. Ridden for the second time this meet by jockey Pedro Espinosa, the 4-year-old gelding captured his first career stakes this afternoon. Perhaps he sent notice that he was primed for a big effort when he won a $5,000 claiming event at 870-yards here on January 6 by over six-lengths. But today he was facing defending champion Jw Who Dat and several other stakes-placed distance specialists. He broke well and shared the early lead with three other runners, until he and Jw Who Dat drew off and dueled to the wire. Freakin Patriot got the nod by a neck, crossing the wire in :46.715 seconds over a fast track. Jen Sokol, LAD Racing Office Manager, presents the winning connections of Freakin Patriot Dash the Magnolia Stakes trophy on Saturday at Louisiana Downs. "I bought him from (his breeder) Bobby Touchet at the end of Delta for $4,000," said Huitron. "He wasn't sure how much of a racehorse he had, but sold him to me provided I ran him in Louisiana." Stepping him up to stakes company might have seemed a little ambitious, but Huitron was impressed with his development at the distance of 870-yards. "He won his last race so easily that even though he was running against claimers, we thought he had a good chance," added Huitron. "Today, he ran like a champion!" Jw Who Dat, ridden by Antonio Alberto for owner Giovanni Barron, earned $5,000 for his runner-up finish. The noted distance specialist improved his record to nine wins, five seconds and three third-place finishes in 34 starts. Eric Palacio conditions the multiple stakes winning son of Agouti from the Heza Fast Man mare EW Comment. He has earned over $132,000. Triple C Racing Stables Im Mighty Fast, runner-up in last year's edition of the stakes, closed for third with Jose Rodriguez in the irons. Megan Carter saddled the son of Mighty Corona form the Beat The Feet (TB) mare Sheza Fast Doll. Also a multiple stakes winner, the Brent Cody Leblanc-bred gelding picked up $2,750 to increase his earnings total to $164,340. Rakin In the Jax, under Luciano Duenez, completed the superfecta. Zoomins Jewel ran fifth followed by Tm Dees Shine. Desert Streak and I Like Bux were scratched early. Sent off as the longest price in the six horse field, Freakin Patriot paid $28.20 for the win. His $15,000 winner's check boosted his career bankroll to $35,165. He has four wins in 12 races; three of those wins came at the distance of 870-yards. Located near Shreveport in Bossier City, Louisiana, Louisiana Downs opened in 1974 and was purchased by Caesars Entertainment in December, 2002. With annual Thoroughbred and Quarter Horse racing seasons, the track is committed to presenting the highest quality racing programs paired with its 150,000-square foot entertainment complex offering casino gambling, dining and plasma screen televisions for sports and simulcast racing.